eFaucets.com charges a 15% restocking fee for all returns... even if product was misrepresented. Plus you have to pay shipping back to them. Think twice before doing business with any online retailer that charges a restocking fee. That is bad policy. Play safe and buy from Amazon.com or other online merchant that makes returns easy and painless. 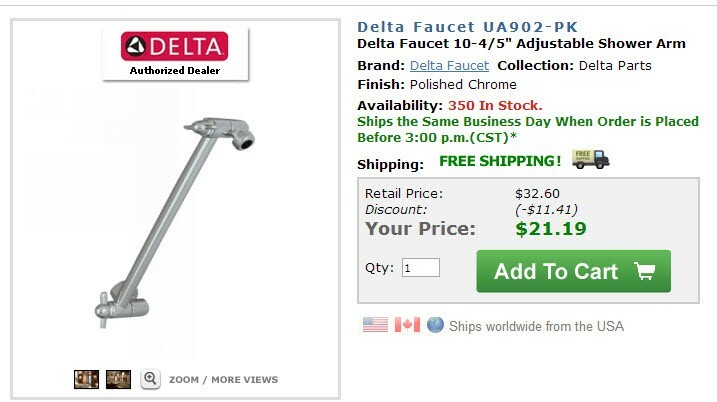 eFaucets.com failed on several fronts -- misadvertised a product, wanted me to pay to return misadvertised product back to them (even though I would not have purchased if it was properly advertised) plus wanted me to pay a 15% restocking fee for a product (shower arm extender), that was unopened, undamaged. I recommend staying away from eFaucets.com and any other online merchant that charges a restocking fee. I have to Rant about eFaucets.com for just a minute. 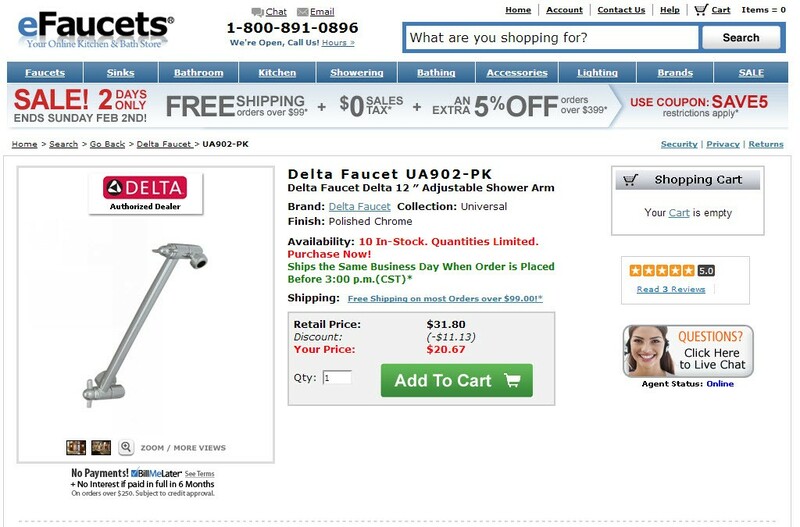 I wanted a shower arm extender for my shower. My old one was leaking and in poor shape. I went to local hardware stores (Home Depot, ACE, Lowes) and could only find a 9″ extender… I wanted a longer one. I searched online and found one on eFaucets.com. See screenshot below taken 2/2/14. Notice the description says Delta Faucet Delta 12″ Adjustable Shower Arm. Just what I wanted. It also says “10 In-Stock”. I ordered it. It took nearly 3 weeks to arrive. Another part I ordered arrived in about 7 days. Makes me wonder if it was really in stock. Finally, it arrived. To my disappointment, the arm was only a 9″ extension… same as I found at Home Depot and Ace Hardware. This is NOT what I wanted or what description said it was. I went back online to read how to return. One those chat pop-ups came up to chat with a sales rep… So I clicked on it and had an online chat with a service representative. He said I would have to call and talk to someone at main office during business hours – he couldn’t help me. The next day I called and was told to fill out a return form. I was told that I would have to pay return shipping and a 15% restocking fee. I said, “Wait a minute… you misrepresented the specifications on your website. I shouldn’t have to pay anything.” I was told that was their policy. I would have to pay. Or I could open up a formal complaint (or something like that)… For a $20 item, I said forget it. Not worth the hassle. 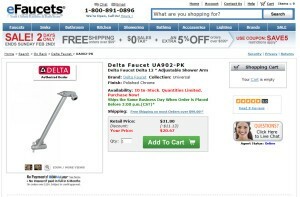 Same model number Delta Faucet UA902-PK but different description. It now says 10 4/5″ extension. In reality it is 9″… maybe if you rotated the head end straight up you may get 10″ but then water would squirt straight up unless you had a swivel head attached. So my RANT is – eFaucets.com fell way short on customer service. Did not seem to care if I was unhappy. Was not concerned that they misadvertised a product. And efaucets.com has a terrible return policy… even if the product was as advertised. Come on… 15% restocking fee. Those are the old days of online shopping. Return shipping… that is a reasonable request (had they not misrepresented the product). I will NEVER buy from eFaucets.com again. I will ONLY buy from online retailers such as Amazon that take things back, often pay for shipping and do not charge restocking fee. Or buy from websites that have a brick & mortar store such as Costco, Home Depot, Lowes, Ace, Walmart, Target, Kohls, etc. where I can return to the store (with no restocking fee). Online merchants should calculate returns into their pricing and make returns easy, painless, and not charge restocking fees. If you went to Target and purchased a shirt, got home and it didn’t fit, would you want to pay 15% restocking fee when you returned it to Target? Ridiculous! One last rant – I left a review on their site in February, mentioning the wrong size, etc. It never got posted. I’m leary of sites that screen their reviews and only include good ones. I like to keep my Rants to a minimum… I like to keep this site positive… but it is called Bob’s Rants and Raves, so if I come across something that deserves a Rant, I’ll post it. Share this if you feel the same.